How is Inheritance achieved in C# (C Sharp)? Inheritance is where you have a generalized class whose behavior is extended in specialized class. For example, there are different shapes namely square, rectangle, octagon and many others. All of them have common characteristics of a shape, for example Area. You can compute area of any shape but each shape has its own formula for computing area. Such common characteristics will be captured in the class shape which will then be inherited by specialized classes like square and rectangle. There are different types of inheritance. They are pictorially represented with real time examples in the diagram shown above. 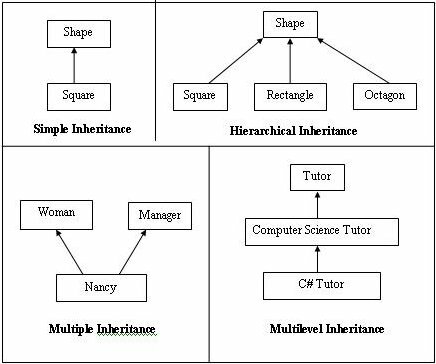 Apart from the simple inheritance, hierarchical inheritance, multiple inheritance and multilevel inheritance, you can also have a hybrid situation wherein you have more than one type of inheritance jumbled together. Here sampleRectangle derives from sampleShape, this demonstrates simple inheritance. However, sampleTriangle also inherits from sampleShape and both the derived classes override area method to implement the corresponding formula. This demonstrates hierarchical inheritance. Note that derived class can access and override methods of all its parents in the hierarchy and not just its immediate base class.